Arm Chairs - Not Just For Living Rooms. You know that place - near a window, next to the fire, in a special quiet place, or strategically placed as part of the conversation - where an accent chair makes the perfect complement to your bedroom, living room or office furnishings. 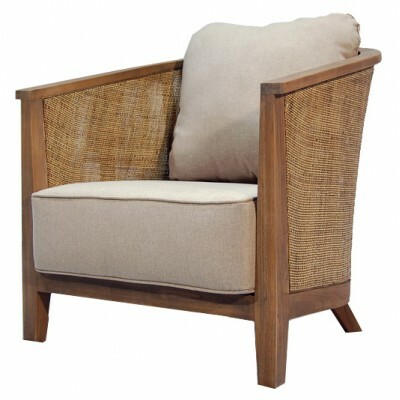 Our coastal arm chairs are of the highest quality and come in rattan weaves and a variety of upholstery options to choose from to compliment your other seating. You might also want to browse our accent tables and rugs to complete your coastal style. Coastal Style Wing Accent Chair PacificHomeFurniture's trademark Bali collection ha..
Sophisticated Accent Chair Pacific Home Furniture’s Arm Chair is a versatil.. Chic Beach Lounge Chair Pacific Home Furniture gave this traditional Lounge Chair a Beachy ..
Sophisticated Chaise Lounge This Corey Chaise from Pacific Home Furniture is a perfect ..
Sophisticated Tub Accent Chair Pacific Home Furniture's FiFi Accent Chair i..
Sleek Occasional Chair The Julian Occasional chair has soft marbled leatherette fabric ..
Teak Wood Accent Chair This uniquely designed Juliet accent chair boasts a fu..
Rattan Wing Back In Vintage Grey The Kelly Wing Back accent chair has a neutral light v..
Casual Rattan Wing Back Chair Looking for a casual wing back chair with a vin..
Casual Rattan Arm Chair Looking for a casual arm chair with a vintage feel? The M..
Uniquely Designed Accent Chair The unique design of our Maxwell Accent Chair ..
Rustic White Rattan Accent Chair Bring a casual elegance into any seating area with the..
Vintage Grey Rattan Accent Chair Bring a casual elegance into any seating area with the..
Teak Wood Accent Chair Unique design, beautiful teak wood frame and a neutral rattan pe..
Natural Weaved Kubu Wing Chair- Pacific Home Furniture’s natural Kubu weaving mat..